I recently discovered palm sugar as alternative sweetener. For those who stop by my blog occasionally, will know that I try to use no refined sugars and flours in my recipes, but at the same time try and put some delicious foods on the table. I read about palm sugar in some sugar-free food blogs a few times, and always thought that this is far too exotic to be available in Dubai. By coincidence, I found it in the Thai food section of a regular supermarket the other day. I was jumping even more with joy when I had to pay it and realized it is about 1/4 of the price of agave syrup. Brilliant stuff in every way!! Now here are some facts about palm sugar. Most people will know that refined white sugars are bad, as they are deplete of any minerals and vitamins. Their glycemic index is in the high 60s. The GI of palm sugar is around 35, which means they don't have the blood-sugar spiking effect. Agave syrup has a similar GI as palm sugar, however it contains a lot of fructose. There is also a lot of controversial opinions to be found about agave syrup, as it can be highly processed and you'll never really know when reading the labels. Not so with palm sugar. In India, palm sugar (in the rock-sugar jaggery form) is actually used in traditional medicine, since it contains many minerals and has been found to heal throat and lung infections. Jaggery is rich in magnesium, potassium and iron. In Mexico & South America, it is also known as panela. One good thing about Dubai is, that it is very close to India and the Dubai expat population is about 70% Indians. So it didn't really come as a surprise when I found jaggery in another supermarket that caters more Indian foods. Wherever you live, check the Thai or Indian section of your supermarket on your next shopping trip. I got to buy it in big rocks, but these are easily chopped with a knife or can be blended into powder form in a food processor. I couldn't wait to try my new discovery in some cake, muffin or dessert. 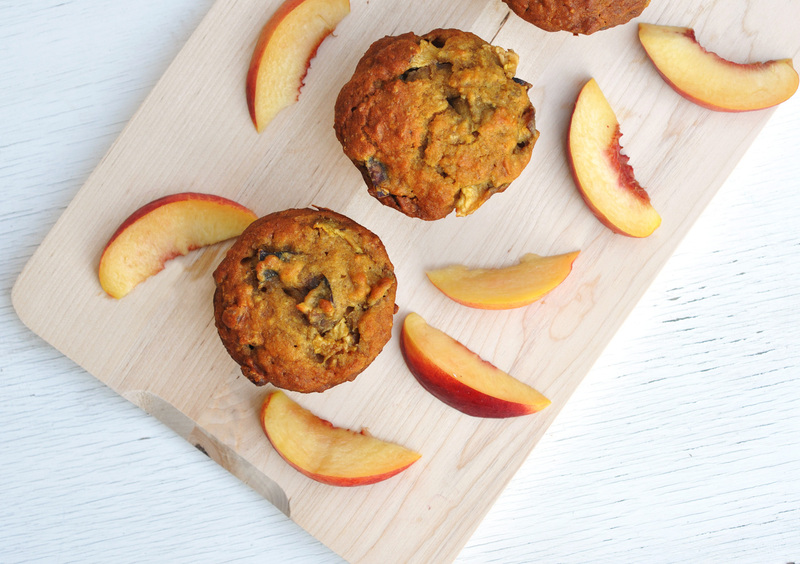 What do you do when 4 pounds of the sweetest nectarines at home? Of course, you'll eat most of them straight out the box. For whatever is left, use them for these muffins. I used my Apple Oatmeal Cake Recipe and basically just swapped the apples with the nectarines. I recommend you only use really sweet and juicy nectarines. Anything bland or hard does not work in these muffins. Make these when nectarines/peaches are in season and you'll get the fruitiest muffins on the planet!! Preheat oven to 180C (350F). Grease a muffin tin or line with muffin liners. In a large bowl, pour boiling water over the quick cooking oats. If you use solid palm sugar, chop it up and stir it into the hot oatmeal water mixture. Slice the butter and place on top of the oat water mixture. Let stand for about 10 minutes. Lightly beat the egg. If you use agave syrup instead of palm sugar, combine with the beaten egg. Mix well. Pour over the oat mixture and stir until well combined and butter is fully melted. In another bowl, combine flour, baking soda and salt. Combine wet with dry ingredients and mix well. Stir in the raisins and the nectarines. Pour the batter into the prepared muffin tins. Bake for about 25 minutes or until toothpick comes out clean. Let cool completely on wire racks.